Place all the presto ingredients, except the oil and lemon juice, in a food processor and turn on to a medium speed. Slowly pour in the oil until it all blends together. Add in a squeeze of lemon juice. Remove from the processor and store in the fridge in an airtight jar until needed. Cut the potatoes in half and place in a saucepan of salted water. Bring to the boil then turn down the heat and simmer for 8-10 minutes or until the potatoes are tender when skewered with a knife. Drain and set aside. Heat the griddle pan and lightly oil with rapeseed oil. Cut open the chicken in the middle lengthways, halfway over, but don’t go the whole way through. You want to be able to open the chicken like an escalope and cook quickly. Season the chicken and grill on both sides until the chicken is cooked though. Grill the bacon until crispy then cut into strips. Add the pesto, tomatoes and bacon to the warm potatoes and stir in well, crushing some of the potatoes. 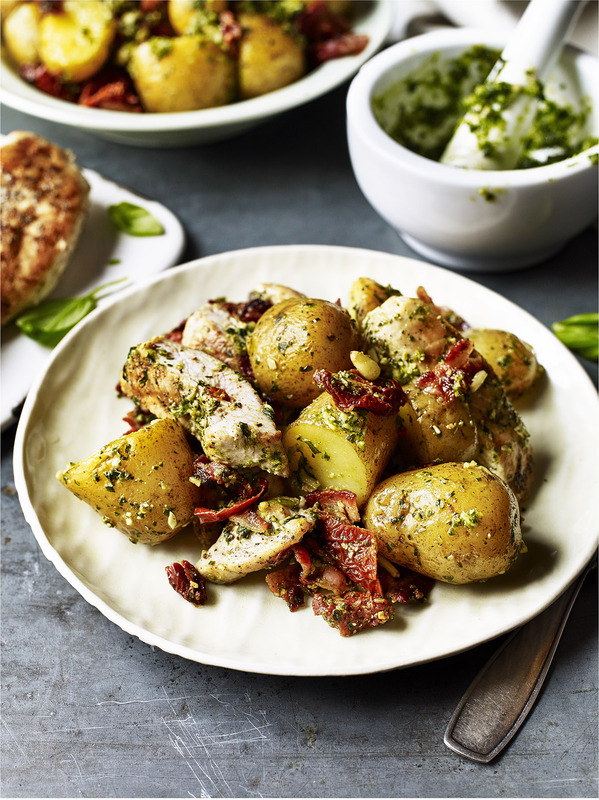 Top the potato mixture with the chicken and drizzle with extra pesto.